I recently became aware that Rosie, who I used to work with, has an unusual hobby. She goes A to Zedding with her boyfriend Doug. 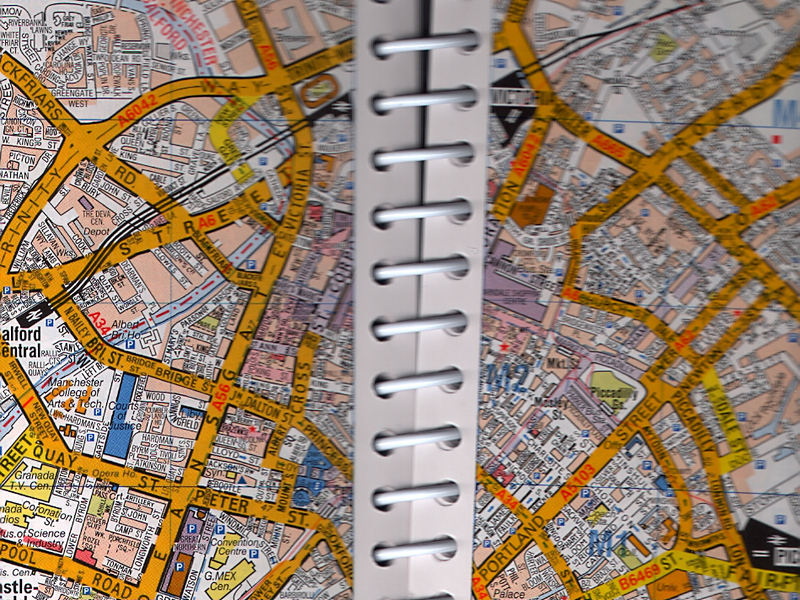 Marie and I decided to give it a go, giving us a convenient excuse to explore Manchester a bit more thoroughly. If it doesn’t turn out to be a passing fad for us, we’ll make it a proper blog of its own, but for now I’m hosting the words and she’s hosting the pictures. 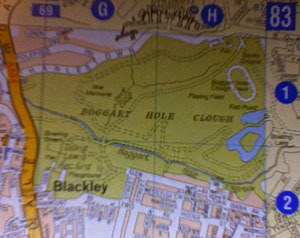 From a number of places chosen principally for their amusing names, we narrowed it down to Boggart Hole Clough, a park in Blackley, a northern suburb of Manchester. – evidence that Conservatives, who must be in a bit of a minority in northern Manchester, are banding together for safety. Then we found the clough, which is basically a mix of a country park with a city park. Country because it has a ravine running through it. (‘Clough’ is a local word for ravine, the helpful signs told us. They also said it was a ‘semi-wilderness’, which was stretching things somewhat.) City because it also has sports fields and a boating lake and graffiti and stuff. We were rather alarmed by this. However, we failed to keep a dog on a lead, or to remove any faeces, at any point during our visit, and didn’t get into any trouble. We looked for boggarts under the first bridge and found none. When we found the bridge on the right, though, we realised no self-respecting boggart would have lived under the first one. But this is an A to Zedding blog, not an excuse to join these fine people and start up a quotation marks protection society, so I shall desist. So, walking around the lake, we found a little boathouse, because finding things from the A to Z is the point. There was even a little babby one! Someone had put out bits of carrot for them, and once they realised we were just going to make high-pitched cooing noises and take photos from the far side of a fence rather than eating them, they went about their business as normal. Well, it was a bit nippy. Should have put a jumper on. It has very steep steps to keep boggarts out. So, that was our first Zedding trip. Watch this space to see if we can be arsed to do it again. I hope we can. And do tell us if this is a self-indulgent ramble and we need to restrain ourselves when blogging our Zedding in future.